MONDAY, Feb. 1, 2016 (HealthDay News) -- People who smoke marijuana as young adults may have a slightly harder time remembering words by the time they reach middle age, a new study suggests. However, pot use does not appear to damage or dim other mental capacities, such as the ability to think quickly, focus or problem-solve, the study authors said. "We were really surprised by the findings," said study author Dr. Reto Auer, an academic chief resident in the department of community medicine and ambulatory care at the University of Lausanne, in Switzerland. Pot's impact on the ability to memorize words appeared to be incremental, meaning that "the more you smoke, the lower your verbal memory," Auer said. Still, he stressed that the results "are only associations," and not proof of cause and effect. He also said the study only examined pot's impact on verbal memory, not overall memory, and didn't assess whether participants or their friends thought pot smoking had actually left them impaired. Auer and his colleagues reported their findings in the Feb. 1 online edition of JAMA Internal Medicine. 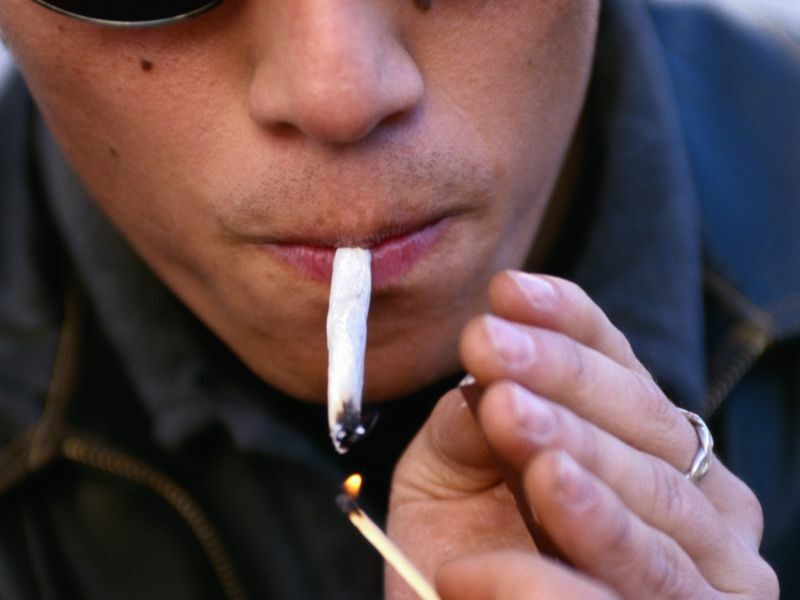 To explore the potential long-term impact of marijuana use, the investigators focused on nearly 3,400 white and black men and women who were between the ages of 18 and 30 when they first enrolled in a national study in 1985 and 1986. The participants were residents of Birmingham, Ala.; Chicago; Minneapolis; or Oakland, Calif. All were tracked for the next 25 years (up until 2011), during which time marijuana use was self-reported at seven follow-up interviews. Almost 85 percent of the study participants said they had smoked pot at some point or another, and about 12 percent said they continued to do so in middle age. Thinking skills were assessed at the end of the 25-year study period. The testing covered verbal memory, measured by the ability to memorize and recall a list of 15 words; visual motor speed; working memory; sustained attention skills; and the ability to problem-solve and plan. In the end, the study authors determined that middle-aged participants who were marijuana smokers when they reached the 25-year mark fared worse in terms of verbal memory and mental-processing speed. The team also found that the greater an individual's lifelong exposure to pot, the more their verbal memory seemed to have dimmed by middle age. Specifically, this incremental slide in verbal memory skills meant that for every five years of marijuana exposure, one or two of the study's middle-aged participants were able to remember one word less from the test list of 15 words. The finding held up even after accounting for a range of other factors, including smoking, drinking and drug use; exercise habits; depression history; and blood pressure and cholesterol levels. Lifetime exposure levels were not, however, linked to any other type of observed impact on the other skills that were tested. Those who smoke marijuana every day for many years are the most likely to experience the greatest drop in thinking skills, suggested Wayne Hall, author of an accompanying editorial. Hall is director and inaugural chair of the Centre for Youth Substance Abuse Research at the University of Queensland in Herston, Australia. "The study did not measure use precisely, but the pattern of cannabis use that most often produces these type of effects is daily use over a decade or more," Hall said. "Cannabis is a drug, and like all drugs it can harm some users when they use it in particular ways. This study adds to the substantial evidence that the daily use of cannabis over periods of years and decades can harm the mental and physical health of people who use it in this way," he added. Paul Armentano, deputy director of NORML, the Washington D.C.-based marijuana legalization advocacy group, suggested that the findings need to be placed in context. "Ultimately, this study's findings are consistent with the notion that while cannabis is not altogether harmless, its potential risks to health relative to other substances -- including legal substances like alcohol, tobacco and prescription medications -- are not so great to warrant its continued criminalization," he said. "By any rational assessment, the continued criminalization of cannabis is a disproportionate public policy response to behavior that is, at worst, a public health concern. But it should not be a criminal justice matter. These findings do little, if anything, to change this fact," Armentano added.